If you are doing some home repairs or remodeling, then you may run into some necessary electrical calculations. It is important, both for safety as well as upholding high standards of craftsmanship that all electrical work is done according to standards set by the National Electric Code and is able to pass inspection by local ordinances. Additionally, wire that is improperly installed poses a risk of shorting out and catching on fire. Many municipalities require a permit followed by an inspection for all remodels or new constructions. 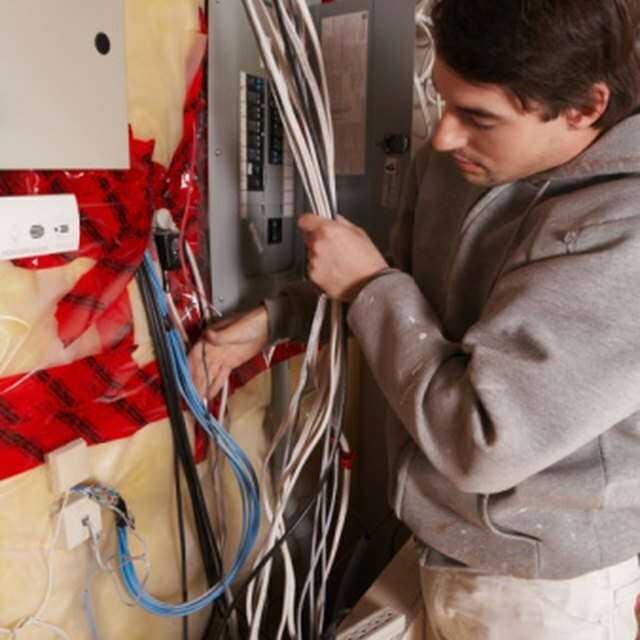 Electrical wire can be used for various projects, including home improvements and remodels. Measure the length of your electrical wire with a tape measure. It is good to allow for a couple of extra feet for each measurement so the wire ends can be spliced or soldered, both of which require stripping the wire's protective insulation. Follow the carpenter's rule of measuring twice and cutting once, so that you do not end up with wires that are mismatched for your project. Write down the appliances that are going to be used for the electrical wire. Make a list of the maximum amperage and voltage for each appliance so that you can estimate the type of wire that you need for your system. If you are doing an electrical project for a home, most standard home circuits are measured for at least 100 amps and 110 to 220 volts, depending on which appliances are going to be used. Appliances such as stove tops, ovens, large air conditioners and clothing dryers utilize 220 volts while most other home appliances only use 110 volts. Refer to an electrician's chart, such as the one found at EngineeringToolbox for the appropriate wire gauge by comparing the amperage of the circuit with the wires expected length, measured in feet. Write down the type of wire that you need and its length as well as a simple schematic showing how that wire will fit into your project. Calculate the resistivity of your wire, which will depend on the length, type and and the gauge of the wire. Longer wires will have increased resistivity, which equals a reduction in the power (watts) that each wire carries. The drop in wattage depends on the type of wire that you use. Copper and silver wires typically have the least resistivity compared to other common wire types. The less Watts that a wire is able to carry, the less the load will be, meaning that you will not be able to plug as many appliances into the circuit. An online resistivity calculator is found at Hyperphysics. It is also possible to calculate the size of the wire that is needed for your project if you know the resistivity of the wire, the amps, voltage drop and the distance of the wire (PaigeWire). Write down the values of the circuit that you are planning to build with your electrical wire. There are four different values that are often helpful to know when dealing with circuits: resistance (Ohms), voltage, current (amps) and power (watts). Each of these values could potentially affect calculating the load on your circuit, which could also affect other wiring calculations, such as with amperage in the previous section. Write down the formula for Ohm's Law, which demonstrates the relationship between resistance, current and voltage. Ohm's formula for calculating the load on circuits states that Voltage equals Resistance multiplied by the Current (V = R x I). Write down the formula for power (watts) of a circuit, which is the circuit's Current multiplied by the Voltage. Plug in the units for Current and Voltage and multiply the numbers using a calculator. To convert the power into kilowatt units, divide by 1,000.